Born in Portland, Oregon, Tom Grant is among the original pioneers of the smooth jazz genre, having enjoyed a longstanding and successful musical career going back to the 1980's. In fact, I remember being quite enamored as a child with his hit, "If You Were My Girl", from his 1988 Mango Tango album, which aired for years thereafter on my local smooth jazz radio station. 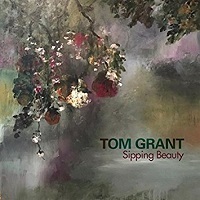 Nearly three decades and a plethora of releases later, Grant is still expressing his artistic brilliance, this time with a beautiful recording aptly titled, Sipping Beauty. Comprised of ten original instrumentals spanning an hour, minimal smooth jazz is imbued with new age and ambient accents on this exquisitely lovely recording. A talented multi-instrumentalist, Grant plays piano, percussion, keyboards and synthesizers throughout. He is also accompanied by David Captein on bass (tracks 4 and 5) and sitar (track 9), along with Kevin Karrick on guitar (tracks 1, 7, 8 and 10). Mary Suzanne Garvey is credited with the album’s painting and poem in the liner notes. The Bossa Nova-tinged “Petichor Perfume” opens with a swaying rhythm, lush pads and delicately flowing piano interlaced with classical guitar. Hazily romantic and dreamlike, this beautiful piece seemingly paints an idyllic scene of sailing in the evening along a misty river. Following next is the caressingly warm “Sun-Kissed Beings”, which conveys a somewhat tropical island feel with its interplay of classical guitar, subtle piano and rhythmic shakers, as hovering background voices lend an angelic presence throughout. The title track, “Sipping Beauty”, is characterized by soft piano keyboard textures that give way to a wash of chimes at the midway point, overall imparting a wistful sense of nostalgia and remembrance. One of my favorite pieces, “Feathers Falling Up”, aptly conveys a delicate airiness with its repeating melody of crystalline keyboard notes that are gently accompanied by shakers, bass guitar and ethnic-tinged percussion. Another especially noteworthy composition is “Wrapped in Love”, where suspended vocal layers, distant echoing drums and perfectly understated twangy guitar notes seemingly recall that of overlooking a canyon sunset. Co-composed with David Captein, “Sighs and Whispers” is a minimal smooth jazz-tinged number that somewhat reminds me of Pat Metheny’s softer musical side. “Arms Wide Open” is another favorite that incorporates all the signature musical elements on the album; while the equally beguiling, “Moondrops”, weaves Indian sitar into a lushly flowing current which follows along a deeply meditative course. Often conveying a Mediterranean flair wrapped in a sensual haze, Sipping Beauty is ever-romantic but not overly sentimental, effectively imparting a subtle sense of mystery throughout. It’s especially wonderful to see Tom Grant still actively creating music and exploring new sonic terrain, which simply works to perfection on this exquisitely elegant and tastefully sumptuous album!